We had it all figured out. The money was coming in. It was location independent (real estate and stock investments). So we sold our stuff, packed up the Armada with our four little tots and drove to Costa Rica. It was a fabulous year. We swam in tropical waterfalls, sunbathed on beaches, bungee jumped from bridges and swam with wild dolphins. We were broken. We were sneered at with comments like 'Welcome back to reality'. We considered giving up. We looked at buying abandoned new-construction houses in a dejected real estate market. My husband applied (and was offered) a cubicle job making $100k a year. Perhaps this was to be our fate. But then we came to our senses. What are we thinking????!!! Our greatest fear was living just an 'okay' life. We may not know how to earn the money we needed to live the life we wanted, but could trying and possibly 'failing' (again) be worse than acquiescing to a mortgage and a cubicle job? We wanted travel, exploration, adventure. We wanted the world to be our children's classroom. I don't care what it took, we would find a way to fund our ridiculously awesome dream. How can you pay for all this travel with a family of SEVEN (okay, six at the time, and now EIGHT)!? The answer? We really didn't know. We felt we were scraping from the bottom of the barrel for money to pay for what we were doing, using every resource we could come up with, all the while trying to find 'the answer' ourselves. How do you do it? We finally came to a a couple of realizations. If you’re like most people, you probably believe that the only thing that keeps you from living the lifestyle you want is more money. If you had more money, then you could do all the things you wanted to do. But the truth is, it’s a lot more complicated than that. Living the life of your dreams comes down to priorities (Chapter 3), not money. Having or making more money won’t help you to live a life of purpose if your priorities aren’t in place, and if you have lots of bills, and lots of ‘stuff’ to care for - and all the other things we’ve discussed in the previous chapters - more money can’t help you if the other critical elements are out of whack. Until you have all those other things sorted out - until you stop blaming money for what you lack in your life (Chapter #2); until you know what’s important to you (#3); and what your purpose and passions are (#4); until you know where you’re starting from (#5); where you want to go (#6); what you’re currently exchanging your time and energy for (#7); and eliminate what’s distracting and holding you back (#8); and until you believe that you’ll actually be able to create the life you want (#9); and push past obstacles and challenges (#10) and start living independent of the opinions of the herd (#11); until you know and do all of those things, adding more money to the equation will only add to your problems, not solve them. Second, there is no single 'answer' to funding a 'non-traditional' lifestyle, just like there is no 'right' way to live. there are people out there traveling the world, living their dream life, funded in a myriad of ways, each as varied as the individuals themselves. There's not just ONE answer. There's lots of them. For others, the dream life is living in Costa Rica with their family while working remotely for their employer in the States. 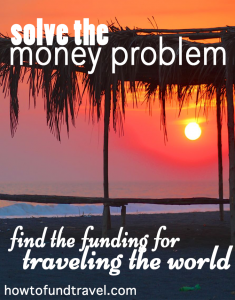 Or it looks like a round-the-world trip with three kids, exploring Mexico, Europe, Southeast Asia and the South Pacific, paid for by income from their location independent business. Some people teach English online, or at a local school in another country. Some have jobs with the Foreign Embassies, non-profit organizations, or big corporations. We've been able to do the traveling we have because of our priorities, even when we lacked money. But with priorities firmly in place, it's helped us to create the funding that will make our dream a long-term reality. You have to put the cart in front of the horse. We really recommend that you too make sure the 'basics' are in place (our book can really help you with that process.) Once they are, then you'll be ready to build on them (see the five steps below) by starting the business, negotiating with the boss or finding the international employment. In today's global, information and community driven economy makes it even more probable for regular people to create lifestyles that were previously only available to the 'rich and famous'. But in order for it to happen you have to have the right mindset. You absolutely MUST believe that you can do it, not by making decisions based on your current competencies, but on the certainty that you can learn whatever skills are required to figure it out. How bad do you really want it? Then be determined to make it happen. Once you have the mindset in place that you're going to create an incredible life of travel and adventure, then you have to see clearly in detail what that looks like for you. Are you an expat in a foreign land, working online or remotely? Or are you wandering from place to place as a travel journalist or blogger? What does your ideal lifestyle look like? You can't hit a target you can't see, so the vision of your dream life needs to be crystal if it's ever going to happen. Now it's time to take a real close look at those finances. What is your current income (and where does it come from)? What are your expenses? How can you reduce them? What debt do you have? If you want to make travel (more of) a priority in your life, then some things will need to be sacrificed -- maybe the cable or that Netflix membership -- in order to make it happen. Debt will definitely have to go. How can you redirect your current income to reducing debt and saving more? How can you make some extra money on the side? 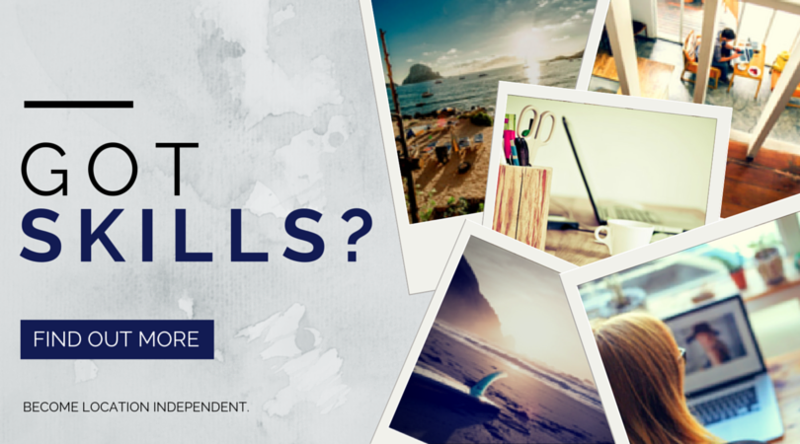 What things can you sell to get ready for (and help pay for) that trip or move abroad? Will you take your vehicle and travel overland through Central America, Europe or your home country? Will you fly from destination to destination? Will you slow travel and rent, or travel more quickly and stay at hotels? Will you keep a home base and have 'at home' expenses, or will your living and travel expenses be one and the same? Or will you simply move abroad and stay put? Will you need to buy a vehicle? All of these factors will play a part in the cost of living your dream life. Go through the scenarios one by one until you determine which will work for you, and have a number of how much you need each month to support it. As today's 'gurus' like Seth Godin and Gary Vaynerchuk teach us, you are your own personal brand. You are your own corporation. There is no such thing as job security in today's market. The only security comes from your ability to provide indispensable value to those who need it -- whether that's as an employee or as an entrepreneur. It is absolutely possible to live a life that (right now) you can only dream about. Thousands of people have made it happen, regular people just like you. You can too. It starts by taking action today on the steps above. Where will you be in a year? Closer to your dream, or stuck in the same rut? How We Became a Nomadic Family: Part 4 India! Can’t wait to here what your making next. Awesome! I will share this with all the people that ask me how to live an adventurous life like we do (we are translators by the way, a great way to finance a travel life!). I’ve been following your blog for awhile but this is the first comment I’ve made. Great stuff btw. I need this book to make living location independent more of a reality for me and my wife. We have goals for it, but I think we’re lacking in our priorities. This book will help us consider our priorities more honestly and help us simplify our life to the extent that living our dreams can become a reality. Thanks for taking the time to comment Davey. You’re definitely right about that, it will help with those things for sure! Love that you kept going and are still pushing forward to follow your dream. We are also on our own adventure of family travel. Looking forward to reading your book! My big dream is to pack and and just go. My boyfriend and I are planning a mini Pan-Am journey for next year but keep running into budget issues beyond our six months planned. I think this book would inspire me and help me save! Do you know anybody in the north of Brazil? In the Amazonas state? That is so great!! Way to go Tereza! No, we don’t know anyone (yet) in north Brazil. Are you thinking of going there? So true. I know that you have to put life pursuits and goals before financial goals. I often forget this in the whirlwind of daily business. Thanks for keeping me focused. Our dream is to become location independent, slow travel the US in a trailer and visit many other countries with travel hacking tools that we are learning. Thanks to you (and other bloggers that we read), we have learned that everyone’s choice should be to live deliberately and we are trying to do that everyday now even before we reach our location independent dream. We are currently working on selling a townhouse, a brick & mortar business and paying off debt. I’m sure that your book would assist us on this journey. Excellent goals Nancy! And good job on living deliberately now, instead of waiting until you reach your goals. That’s how you do it! My dream is to be able to travel 3-6 months out of the year with my family. I want to take my kids (6 of them!) to climb Mount Kilimanjaro. I want to find a way to modify my current business so that it is more flexible and less dependent on my immediate presence. I want to share the world with my family, and teach them that there is so much more out there! My dream is to find myself again. It seems as though I have lost my true self over the years. I’m beginning to rediscover myself. That is a very beautiful and worthwhile dream to have! I have been stalking the blog for about a year now. Loved your stories of triumph and trial. I think that it is fabulous that you are living your life how you want. I didn’t think that I wanted that for my family until this post. I have always thought the problem was not enough money. Thanks so much for changing my perception. I am going to continue on my journey and live my dreams. Thanks again.